If you seem to keep attracting the WRONG kind of men – or you feel like there are no good available men out there and you’re feeling hopeless about finding the right man for you – I know exactly how that feels, and I can help! Perhaps you attract men who are unavailable, dishonest, unfaithful, afraid of commitment, have anger or addiction issues, or always have some "obstacle" in their life that prevents them from having a REAL, committed relationship. If you're anything like I was before I turned things around, you may attract men who run "hot and cold" – or they come on really strong in the beginning, only to pull away or disappear when things start to get serious. If you seem to keep attracting the wrong kind of men and you’re having trouble finding the love of your life, there may be something that you’re doing or NOT doing that’s blocking this kind of man from showing up in your life and coming towards you. I know many beautiful, smart, successful women who unconsciously sabotage their deepest desire to find love. There’s actually a REASON why some women are “lucky at love” and why some women seem to struggle in dating and relationships (even though they may look similar on the outside!). No matter how much we think we know about men and relationships, we’re all held back in love by our past training. We all have specific “systems” in place that chain us to our old patterns and old results, and most of us are constantly and unconsciously pushing away the very love we want. The truth is, what's happening on the INSIDE of someone has a huge impact on how "lucky" they are when it comes to attracting the right man and a maintaining a fulfilling relationship. For those of us who haven’t had easy love lives – where love equals struggle, "obstacles" or pain – that can be a big problem! How you learned what love IS early in life may not be in alignment with what you truly desire now. If you have a pattern of attracting men who aren't right for you, the intense feelings that often arise when a man feels like "home" to you do not equal true love – even though they can create an addictive high that might FEEL like love to you. These particular feelings come from our subconscious mind, which doesn’t make judgments about what’s good for us and what isn’t, it's only concerned with homeostasis and survival – and if you’re alive, it’s because you’ve survived what’s happened to you in your past. Our commitment to to survival has our subconscious programmed this way. So when you’re faced with something that’s familiar versus something that’s NOT familiar – since you’ve survived your past, your subconscious wants to say “you’ve survived this” and you’ll feel drawn to what feels familiar to you. This is why we can feel very attracted to men who we logically KNOW aren't right for us, but sometimes the "chemistry" we feel for these men takes over, and we get involved with them anyway. If you've been attracting the wrong kind of men and you want to attract the RIGHT man for you, you have to work on turning these patterns around and actually changing what feels familiar to you. If you keep attracting men who aren't right for you or you don’t have the love you want in your life, it can sometimes be because you’re not facing or loving a part of YOURSELF. This could be a personality trait that you're not fond of - or a tendency to not love and accept all of your feelings. It could also have to do with how you feel about your appearance, or something you're ashamed of from your past. When there's an unloved part of ourselves, we tend to look outside of ourselves for someone else to love us – hoping that the unloved part of us will just go away. When we do this, we're basically demanding from others to give us the love we’re not giving to ourselves - and this is often happening on a deep, unconscious level. When we don’t love ourselves deeply, we still attract men – just not the right ones. We simply attract people who don’t love themselves either – or who aren't capable of having a loving, committed relationship. If we don’t believe we deserve to be loved for exactly who we are, we can end up pushing away the very love we want! We can spend years of our life running from the parts of ourselves that we think are unlovable – but once you start embracing, loving and accepting ALL the parts of yourself, you’ll remove your blocks to love so the RIGHT kind of man can show up in your life. ...you attract men who are emotionally unavailable, dishonest, unfaithful, afraid of commitment, are already with someone else, have anger or addiction issues, are too busy to make time for you or always have some "obstacle" in their life that prevents them from having a real, committed relationship. ...you seem to attract men who run "hot and cold" – or they come on really strong and pursue you in the beginning, only to pull away or disappear when things start to get serious or "real." ...you want to learn to the tools to attract a high quality, masculine-energy man – the RIGHT man for you who wants to be in a committed relationship! 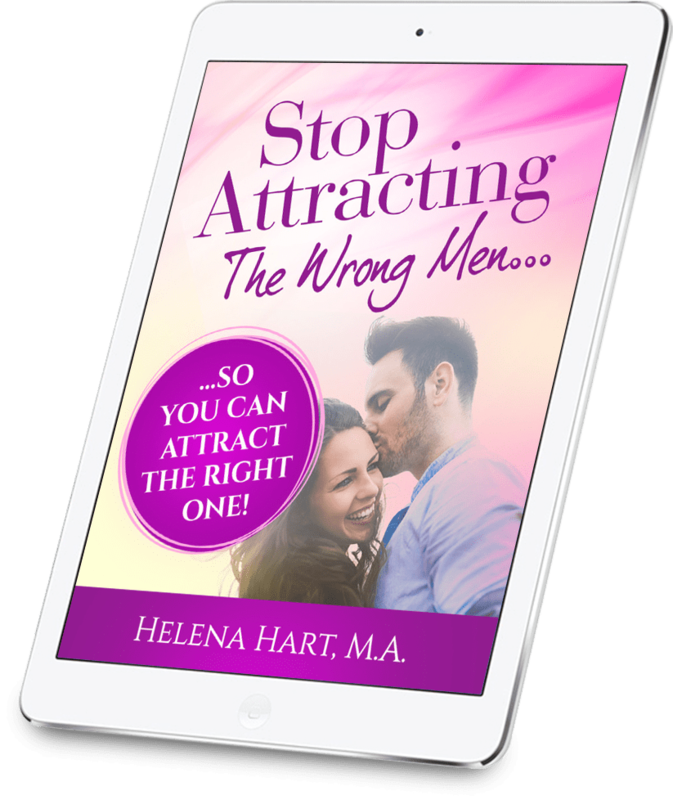 ♥ What To Do If You Fall For Men Who Are "Out Of Reach"
This 65-page eBook is full of tools and SPECIFIC step-by-step exercises to help you quickly stop attracting the wrong kind of men, so you can attract the right man for you and have relationship of your dreams! This program also includes about two hours of video content – conveniently broken up into 12 videos for easy reference - that you can listen to on your computer, smartphone or tablet (even when you’re on the go)! 3. Bonus Material From "Attract The Man You Want," "The Feminine Art Of Attraction," And My "Effortlessly Attract Love Program"
These bonuses will give you additional tools to help you start attracting the RIGHT man for you quickly! The tools Helena taught me were so different from everything I'd learned so far about love and relationships, and I took a leap of faith and started implementing them. Within three months after a break up my whole life turned around. This really works!! I went on my very first date after my break up and met the most amazing man. It was so great to be able to practice everything I had learned so and I was amazed by the results. This is a very masculine energy man - he took me out on dates, drove to my city all the time, paid for everything and kept in touch. The thing that stood out most to me was how comfortable I felt around him. The video about REAL chemistry was one of the most important things I learned in that beginning period. This man was nothing like guys I had dated before and I was amazed at how easy it was to date him! When implementing Helena's tools it all was so effortless to be with him. The rest of my life started coming together as well and I felt like a goddess all the time. This was all very new to me, I have never been so happy in my life. After years of being single and trying to get men to love me it all finally turned around. 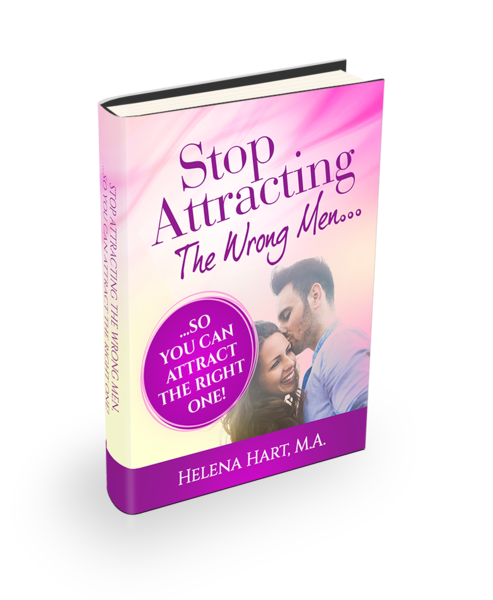 Click the button below to order "Stop Attracting The Wrong Men... So You Can Attract The Right One!" at the special sale price – you can use a credit card, debit card, or Paypal (it's easy, safe and secure) – and your access to the eBook, videos and bonuses will be EMAILED to you instantly!